Carmelo ANDRIANI, nasce a Bari in una famiglia di musicisti, ma è dalla madre che apprenderà “l'Arte del Canto” che gli permetterà di distinguersi, non solo per la tecnica impeccabile, ma per il suo meraviglioso suono di vecchia generazione: “Messa di voce e portamento”, qualità su cui si soffermerà e che affinerà alla Scuola di Felix Ayo e Riccardo Brengola (Roma Accademia S.Cecilia) e che troverà poi nei suoi studi in Unione Sovietica (con Igor Oistrak e Victor Pikaizen), un riscontro di grande stima, tanto da rientrare in Italia pieno di testimonianze autorevoli e un importante diploma di merito. Perfezionamento a Siena con Uto Ughi (Accademia Chigiana). La sua attività di Musicista già svolta in Europa, Stati Uniti, Canada, Messico, Cina, Corea, lo vede solista, e in formazioni cameristiche con nomi del concertismo Internazionale, da Gianandrea Gavazzeni a Lior Shambadal in Germania (alla Philarmonie di Berlino) per un debutto con i Berliner Symphoniker. Ha inciso per la RAI e per etichette discografiche importanti come: (Phoenix, Tactus, Stradivarius, Brilliant Classics). Proprio per la Brilliant Classics ha pubblicato di recente un CD doppio con l’opera per violino e pianoforte del compositore Italo-Irlandese Michele Esposito (Castellammare di Stabia, 29 settembre 1855 – 19 novembre 1929) che va ad aggiungersi a quello con le musiche di Tom Cullivan, altro autore Irlandese contemporaneo con Sonate per violino e pianoforte a lui dedicate. E' a breve in uscita un Recital dal titolo: "Il fascino del Violino Solo". Andriani è titolare della cattedra principale di Violino al Conservatorio “Niccolò PICCINNI” di Bari. Suoi strumenti sono: uno splendido Marino Capicchioni del 1942 che alterna al prestigioso Andrea Guarnieri 1675 e un brillante Sofia 2009 per lui costruito dal Maestro liutaio Angelo Andrulli. Carmelo ANDRIANI was born in Bari, in a family of musicians. From his mother he learnt the “Art of Bel Canto” which will always distinguish him, not only for his impeccable technique, but also for his wonderful sound of the old generation. The so called “Messa di voce e portamento”, qualities upon which he dwelt, perfecting them with his teachers Felix Ayo and Riccardo Brengola (Rome, S.Cecilia Academy), and that later on, during his studies in the former Soviet Union (with Igor Oistrak and Victor Pikaizen), gained him acknowledgments of great esteem, to the extent that he returned to Italy with many eminent statements of praise and an important Certificate of Merit. Andriani has completed his specialization courses at the Accademia Chigiana in Siena, with Uto Ughi. His career unfolds in Europe, United States, Canada, Mexico, China and Korea, both as a soloist and in chamber music ensembles, together with famous international musicians such as Gianandrea Gavazzeni or Lior Shambadal. With the latter he performed in Germany, at the Berliner Philharmonie, for a debut with the Berliner Symphoniker. Andriani has recorded for RAI (Italian Radio and Television) and important record labels, such as Phoenix, Tactus, Stradivarius, Brilliant Classics. For the Brilliant Classics label he has recently published a double CD with the opera for violin and piano by the Irish/Italian composer Michele Esposito (Castellamare di Stabia 29/09/1855 – 19/11/1929), following a CD with the music of Tom Cullivan, another contemporary Irish composer, comprising Sonatas for violin and piano dedicated to him. In addition, a Recital entitled “The Charm of Violin Solo” will be released shortly. 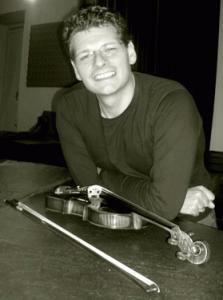 Carmelo Andriani is Professor of Violin at the Conservatory “Niccolò PICCINNI” in Bari. 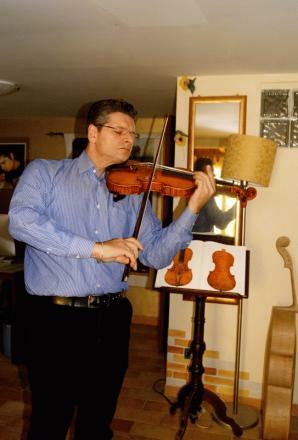 He plays a wonderful Marino Capicchioni (made in 1942) or, alternatively, a prestigious Andrea Guarnieri (1675) or a brilliant Sofia (2009), expressly made for him by the Master violin maker Angelo Andrulli.